Is there anything better than fresh corn, asparagus or vine ripened tomatoes in summer? Fresh blueberry, cherry or strawberry rhubarb pie? Fresh peaches in August? We’re approaching the season that is truly “ripe” with pleasure. You can tout all the highfalutin’ flash freeze phenomena you want; nothing beats the real deal ripe off the vine. 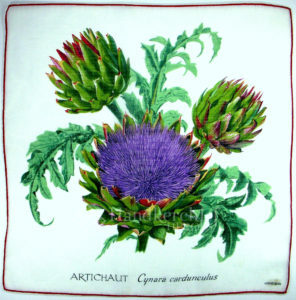 One of my favorite hankies showcases a California staple, the artichoke. 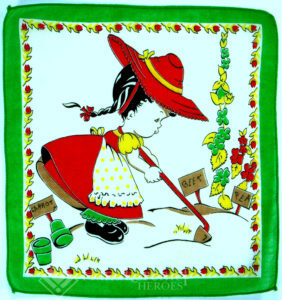 Luckily they grow in profusion in Watsonville, south of San Francisco, along with cherries, strawberries, garlic and truly splendid lettuce. 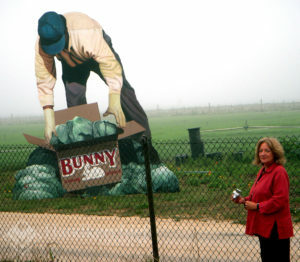 Sadly, favorite produce stands are disappearing as vegetable crops are replaced by the more lucrative wine industry. 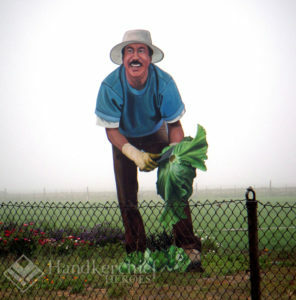 Some farms survive, and I always give a wave when passing by their giant cut outs of farm workers along Hwy 1. (Note their size compared to my friend Lynn standing in the SE corner of the photo.) I don’t know who owns this farm, but I love their creativity and sense of fun. What are the eight juices in V8 vegetable juice? 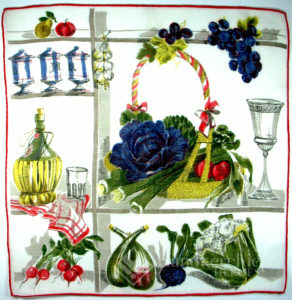 This hankie inspires one to toss a salad right now! 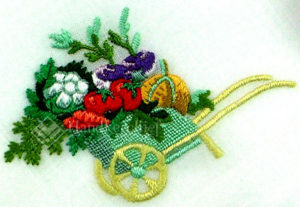 You can almost hear the crisp vegetables snap. Naturally, the requisite oils and herbs must be on hand for the dressing. 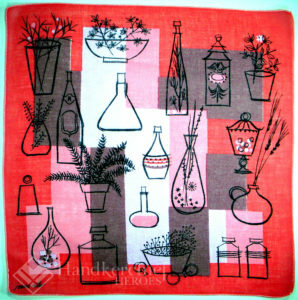 This hankie is so 60’s. Don’t you love it? Perhaps you’ll add a little walnut oil. BTW – how would you categorize nuts? Are they a fruit? In a class of their own? Many know this, but the term was new to me. Walnuts are drupes. A drupe is a type of fruit in which an outer fleshy parts surrounds a shell (we call it a pit) with a seed inside. 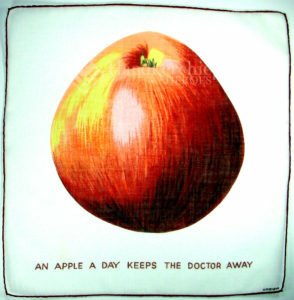 Examples of drupes include peaches, plums and cherries, as well as walnuts, almonds, pecans, hazelnuts, pistachios, etc. (Don’t know if that will win you any bets at a bar, but give it a go.) 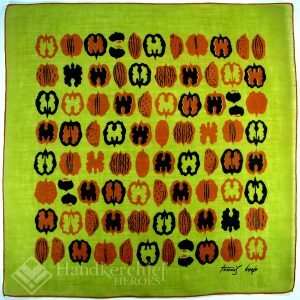 Can you name the nuts in the hankie below? Once again artist Tammis Keefe has managed to make a simple subject seem oh-so-handsome and important. 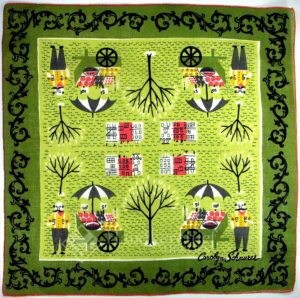 This charming vendor peddles his wares on the cobblestone streets of the local village. You can almost hear “O Sole Mio” wafting from a tiny window. 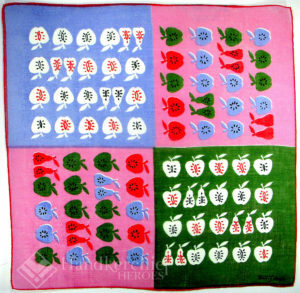 His offerings include lemons and watermelons, additionally featured in the hankies below. These lemons and companion cherries are so bright and merry, they might have just hopped off a Vegas slot machine. 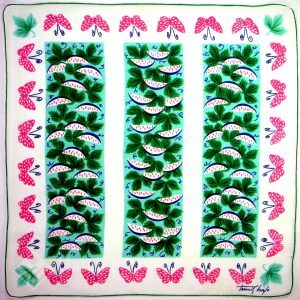 Luscious pink watermelons and hovering butterflies are guaranteed to put you in a good mood. 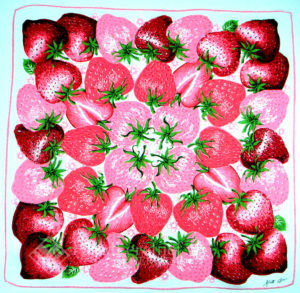 Succulent strawberries make your mouth water, while apples and pears line up for inspection! 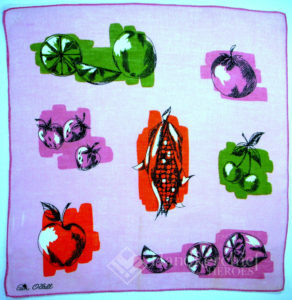 Fresh produce washed with a splash of color is up to the minute modern, while the unalloyed noble Indian corn waits to be ground on the metate, as it has for generations. 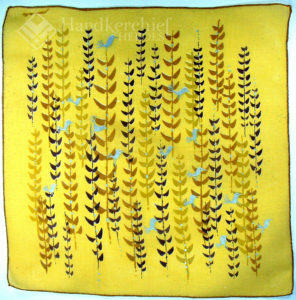 Silver metallic birds gleam in the midday sun as they stealthily stalk fields of ripe corn. Scarecrows stand sentinel in the fields, but crows continue to tempt and tease these quasi custodians. No one outsmarts the wily raccoon, complete with his adorable bandit mask. What superb graphics. 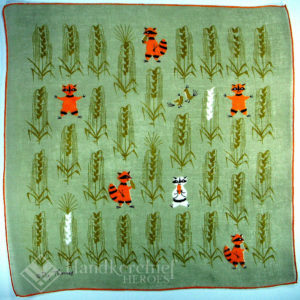 We lost so much when we abandoned the handkerchief. 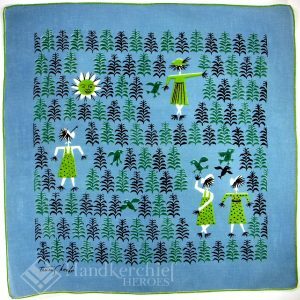 In addition to a fabulous flirting accessory, we forsook wonderful storytelling and the chance to carry artwork in our pockets. 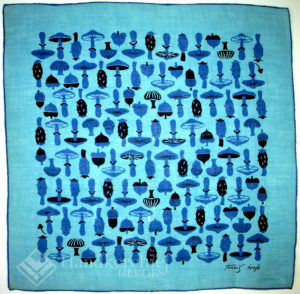 Produce from an upscale farmer’s market make this hankie a fan favorite. Everything about it – composition, color choice, graphics – is perfection. It’s simultaneously stately, succulent, and stylish. for a lifetime supply of what fruit? 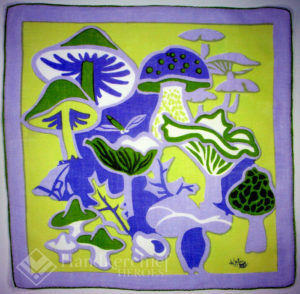 The mushroom is a favorite subject for many handkerchief artists, from puffball to portobello, oyster to enoki, milk cap to morel, and everything in between. 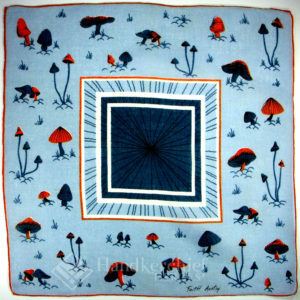 Much like the nut handkerchief, artist Keefe assembles phalanx of fungi for our perusal. 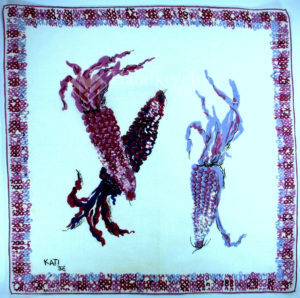 Another artist’s rendition on the right is reminiscent of a walk in the woods. In North America alone there are 10,000 known species of mushrooms, with speculation that number is only 1/3 to 1/5 of what actually exist. Yikes! Naturally, we can’t cover them here, but we can hopefully convey why artists love them. A cryptogram is something written in code or cipher, but what is a cryptogam? 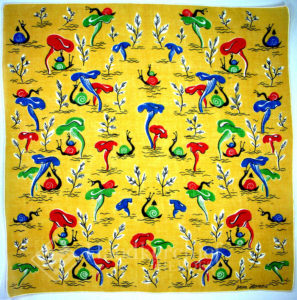 Colorful snails crawl and cavort betwixt and between equally chromatic mushrooms. Yowsa. Perhaps Alice in Wonderland partook of these vivid beauties when embarking on her adventures through the looking glass. 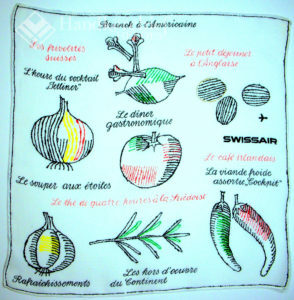 Since Switzerland is known for their beautiful handkerchiefs, it’s no surprise to learn Swiss Air chose handkerchiefs as their souvenir giveaway for many years. 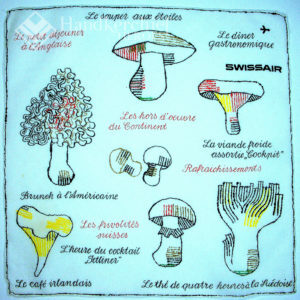 Often, hankies were printed with a menu of the meal being served, and in at least one instance, mushrooms were prominently featured. 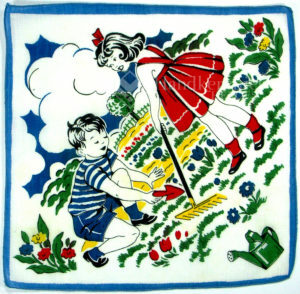 Here’s something you rarely see these days – children working in the garden, but various types of work were often featured on children’s hankies like those seen here. 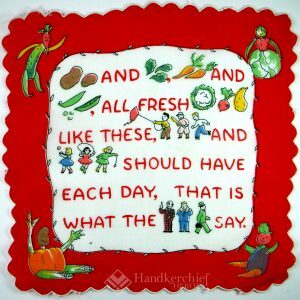 along with admonitions to eat your fruits and veggies. 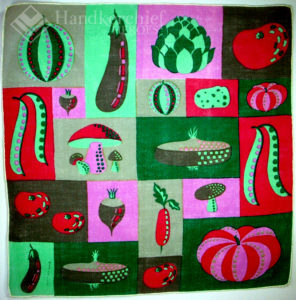 What punk rock group recorded “Every Time I Eat Vegetables It Makes Me Think of You”? 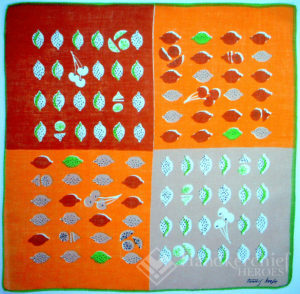 A cryptogam is a plant, such as a fern, fungus, moss or algae, which reproduces by means of spores, rather than seeds. 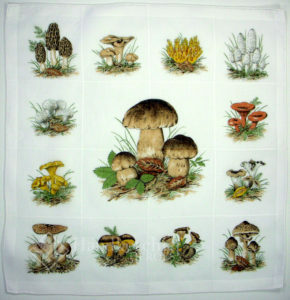 Yep, we’re talking mushrooms, and they proliferate like toadstools on hankies. Cantaloupes, known as cavaillons, are named for the town in Provence where they are still grown.In an arrangement in 1864 with the Cavaillon Public Library, Alexander Dumas was to be paid an “annuity” of twelve cantaloupes every summer for life. He died six years (72 melons) later. “Every Time I Eat Vegetables It Makes Me Think of You” was recorded by The Ramones on the 1983 album Subterranean Jungle. What a kick! Thanks so much.